The most interesting part of today was not that I’ve been rained on for the seventh day running. It’s not that I considered this a ’short’ day at only 38km nor that I’ve got shin-splints and the other shoulder of my favourite hiking shirt is starting to rip. Staying at Nayoro road station was interesting, but I’ll save that for the end. And being targeted by bus drivers passing big puddles isn’t interesting, it’s infuriating! No the most interesting part of today is a man calling himself Barabara. His real name is on his business card but I’ll stick with his chosen label. We actually met last night when he gave me food. This morning I was shouldering my pack when he started preparing breakfast. Since he was also heading to the same place he made me promise to have dinner with him. So this afternoon rather than slink off into the park and camp alone I went along with his plan as he paid the 200¥ for my campground site and didn’t say anything when he told the warden I didn’t have a tent. Unfortunately I’m stuck with that now and have to sleep under the cooking area roof. The mosquitoes were starting to find me, until Barabara provided me with one of those burning coils that scared them away. He said all this was a present as he paid for entrance to the onsen (ahhhh, clean again) and a big dinner. 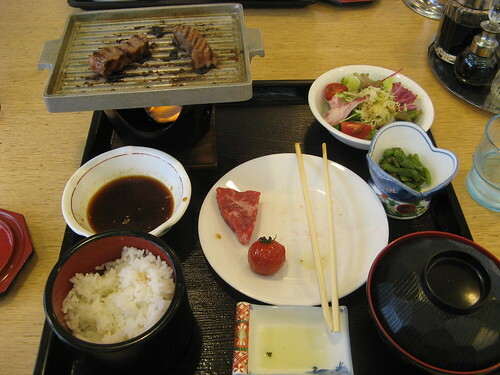 It was a sort of mini-yakiniku. The waitresses lit the single tea-light candle thing under a metal plate and we grilled the most delicious steak as we liked it. 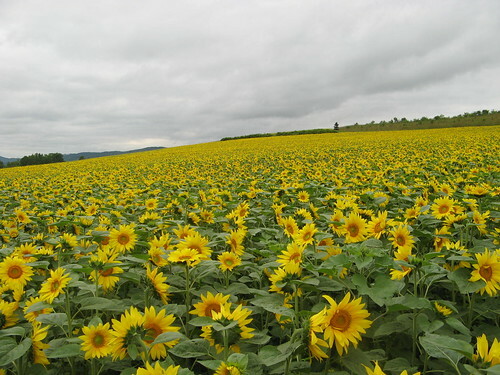 It’s another huge gift that I didn’t understand but it became clearer as we talked. He’s a bit of a walker himself. A retired 64 year old from Hiroshima he said he’s done a few 50km days in his time and invited himself along with me tomorrow as I got from here to the Nakagawa road-station. I’m a little worried about how it’ll work but he’s been so nice to me I can’t say no. Oh yeah, about this morning. Possibly in an effort to stop the homeless sleeping there the building has speakers built into the roof outside that switched to a radio station when the doors closed. At some point the frantic and exciting adverts stopped and a continuous mix of pretty good dance tracks started. With the flashing lights from the vending machines and the tables and chairs (which would have been stolen long ago in any other country) all that was needed for a nightclub was a pile of alcohol and about 50 friends. Seriously, on a warm and dry Saturday night that place would be a great place to hangout. At 4am the music finally paused, a brief intro for the new DJ and then came Billy Joel’s Still Rock and Roll To Me. By the time The Heat Is On (from the Beverly Hills Cop films) played I was ready to start packing but still had to hear a few country songs and one from Gloria Estefan before I hit the road. Tomorrow has only 30% chance of rain. Only. Wow, 100k to go. I wonder how finishing this epic journey will compare to reaching Manning Park. Your journey has introduced you to some fascinating characters. Oh My God! 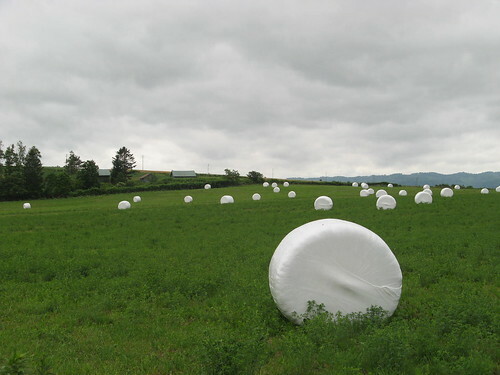 Japan has fields of giant marshmallows! I always wondered where they came from… I was suspicious that they might be milked from tofu bunnies… but now I know better. wait until you see today’s pics of giant humbugs!